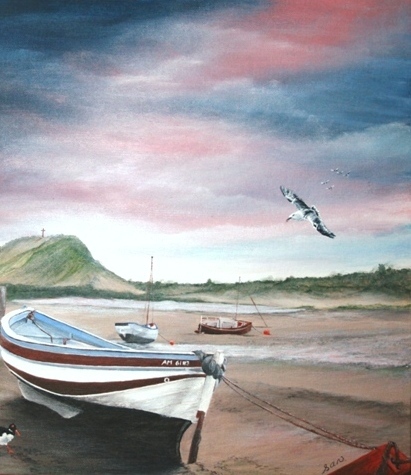 An original, signed work of art in acrylic on canvas board. The art measures 46 x 35.5cm, plus gold frame is 54 x 43.5cm. 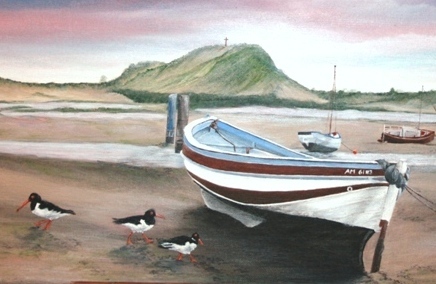 The art is of a lone fishing boat in Alnmouth Estuary, after the tide has gone out, it lies stranded on the wet sand. Oyster catchers scurry around on the sand looking for food as the night draws near. 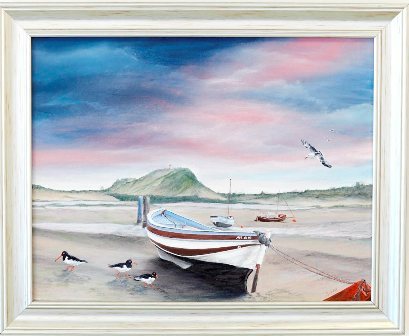 There is an air of peace and tranquility about this art which is true to fact of the beautifuol bay of Alnmouth. The art is varnished and ready to be displayed in your chosen place.